Playtech challenges you to come down to the cave where a fearful ugly creature lives guarding its immense fortune. 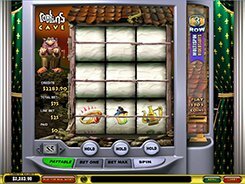 The 3-reel 3-line Goblin Cave slot machine invites you to place a bet and start a thrilling adventure. 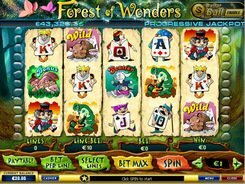 You can set a coin value at $0.01 to $5, and bet a maximum of $75 per spin. On the reels you come across the symbols of a crown, magic lamps, precious rings, coins and other treasures. The best spoils you can grab is 150 coins paid out for matching up three red rubies on a row. The Red Ruby gem acts as the wild replacing other symbols to create winning combinations. Three Lanterns on any payline trigger a bonus round where you have to pick a chest and get the riches. In addition, three bonus symbols on both the first and second lines start 2 bonus rounds. And three bonus symbols landing on all the lines open up 3 bonus games. 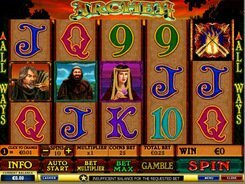 The cash prize you have been awarded will be added to your bankroll after the end of the bonus round. PLAY FOR REAL MONEY!